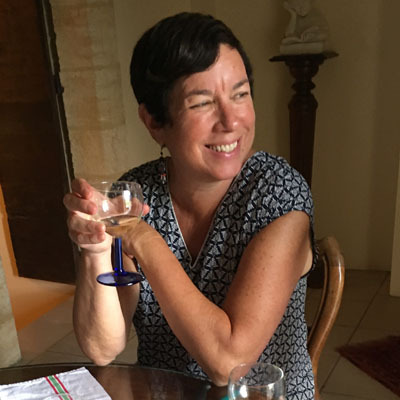 For Here & Now resident chef Kathy Gunst, cinnamon is more than just a holiday spice. She brings hosts Robin Young and Jeremy Hobson a stew as well as a rice pudding that make the most of cinnamon's flavor. 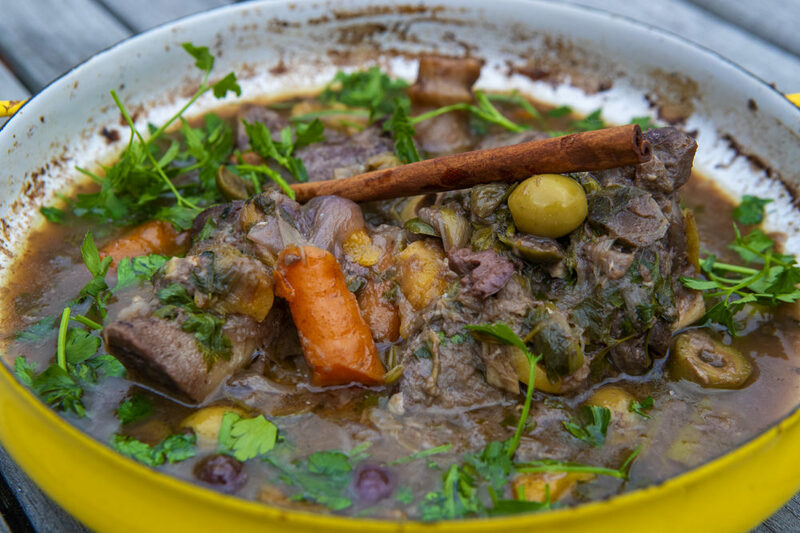 Like a Moroccan-style tagine, this simple, make-ahead stew uses cinnamon in two ways: A cinnamon stick seasons the stock and red-wine sauce, and ground cinnamon is used to season the lamb or chicken and vegetables, along with ground cumin and fresh and dried ginger. The stew can be made a day ahead of time and reheated just before serving. Pitted green olives and fresh lemon juice are added just before serving. Serve with couscous or rice. Place flour on a plate and season liberally with salt and pepper. Lightly flour the meat on both sides. In a large casserole heat the canola oil over moderately high heat. Brown the meat on both sides, about 5 minutes. Remove from the casserole. Discard the oil in the casserole. Add the olive oil to the cleaned-out casserole over low heat. Add the leeks, onion, scallions, half the garlic, salt and pepper and cook, stirring, for 6 minutes. Add the carrots, fresh ginger, remaining garlic, cinnamon stick, ground cinnamon, ground ginger and cumin and stir everything; cook 4 minutes. Raise the heat to high and add the wine; boil for 2 minutes. Add the stock and bring to a boil. Reduce the heat to low, add the browned lamb shanks (or chicken), the orange peel, half the parsley, and the bay leaf. Cover the casserole. Place on the middle shelf of the preheated oven and cook for 1 1/2 hours, basting occasionally or until the lamb (or chicken) is thoroughly cooked and almost falling off the bone. The chicken will most likely be done after one hour. Remove from the oven and stir in the olives, if using and lemon juice. Season to taste. Serve hot over bowls of couscous or rice. Cinnamon is used three ways in this classic comfort food. First, half a cinnamon stick is added to the rice pot when cooking the rice. Then, ground cinnamon and the remaining stick of cinnamon is cooked in the rice pudding mixture. And finally, a sugary-cinnamon mixture is dusted on top just before serving and placing under the broiler, brûlée-style. The rice pudding can be served warm or made a day or two ahead of time, covered and refrigerated. Cook the rice: Place the rice in medium saucepan and cover with the water. Bring to a boil over high heat. Bury half the cinnamon stick in rice. Reduce heat to low, cover, and cook until rice is just cooked through and water is almost entirely absorbed: the rice doesn’t want to be totally tender and cooked. Remove from heat and cool; remove the half cinnamon stick. Meanwhile, in another medium saucepan, heat the milk and cream with the remaining half cinnamon stick over low heat. When slightly simmering, whisk in the sugar, cinnamon and vanilla. Add the cooled rice and cook stirring over low heat for about 15 to 20 minutes or until slightly thickened. Gently whisk in the sour cream, raisins and cranberries. Remove the half cinnamon stick. In a small bowl mix the sugar and cinnamon for the topping. You can serve the rice pudding warm or cover and refrigerate for up to 2 days. 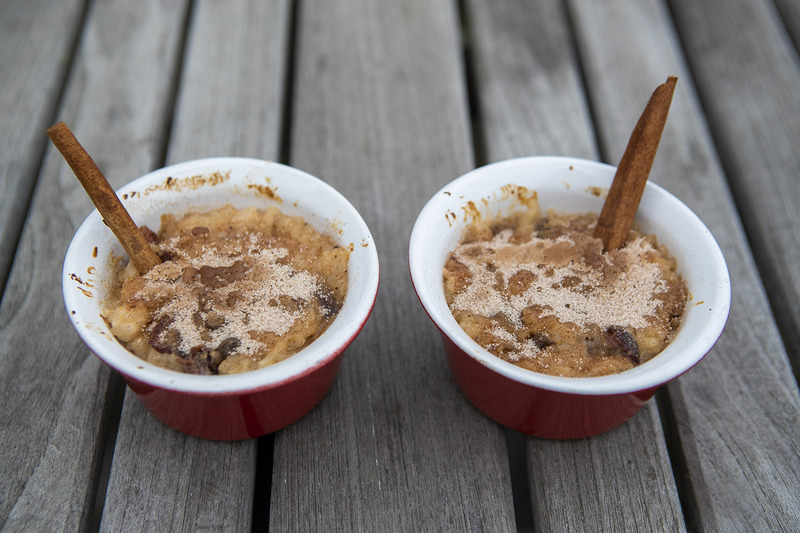 To serve, sprinkle the cinnamon-sugar on top of the pudding and, if you like, place under a heated broiler to just melt the sugar-cinnamon mixture until bubbling. Or you can simply sprinkle on the mixture and drizzle with cream and serve cold. Here's more information on the smoked cinnamon mentioned on the air.